A luxury divan style upholstered bed in a Belgian damask material. 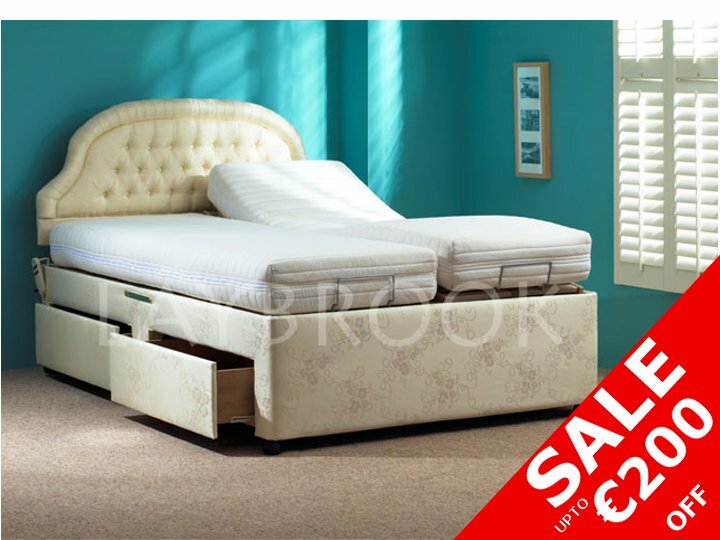 The Thornbury dual electric bed is a handmade crafted strong bed, with a 5 year guarantee. It can come with a drawers in the side or end and comes with a high quality Q-Flex mattress with removable washable cover as standard. The adjustable slatted frame is made from durable beech wood and has top of the range twin Okin motors attached. The mattress is made for the users weight and how they like the feel, soft, medium or firm. The Thornbury adjustable electric bed also comes with a 7 night free home trial. The Thornbury electric bed is a handmade crafted strong bed, with a 5 year guarantee. It can come with drawers in the side or end and comes with a high quality Q-Flex mattress with removable washable cover as standard (UPGRADES AVAILABLE please see above). The adjustable slatted frame is made from durable beech wood and has top of the range twin Okin motors attached. The mattress is made for the users weight and how they like the feel, soft, medium or firm. This bed is available with or without drawers which are strong and solid, quality that you can rely on. This bed comes with a full 5-year guarantee and a Reflex mattress. Unlike some other companies, we only sell beds made from the best quality materials. As with all of our adjustable beds, you can sleep on it for up to 7 nights and if you are not totally satisfied, we will fully refund you the cost of the bed or exchange your mattress free of charge. Laybrook beds are also fully installed by our trained engineers, free of charge! Available in 2ft 6, 3ft, 4ft, 4ft 6, 5ft and 6ft (Special orders can be made to any height or length). Standard size for the Thornbury is 22 inches from the floor to the top of the mattress. Purchasing any Sprung Mattress (Pocket or Superior) may increase the overall bed height. If your bed is ordered with a Vertical Lift, 1 inch is added to the total height of the bed. Adding an end drawer will not affect height, but side drawers will add 2 inches to the overall height. A Heavy Duty Frame will also add 1 inch to the total height. * If you change the specification of the bed it will be a special order (non stock item) and will take upto 1 week longer to make and deliver. The colour of this bed surround is golden. The picture shown is a dual bed. The bed also comes in a single or double. Double bed has one mattress. These are just a few of the testimonials Laybrook receive every month, we hope you find our product and service to be as good and have a similar experience. You can also find us on the website "The Review Center" under Laybrook for the latest reveiws. Laybrook supplied the "White Huntly" bed to the BBC One series 'DIY SOS: The Big Build' and was used as part of a life changing transformation to the home of a family in Durham. This show was broadcast on Wednesday 20th April 2012 at 7.30pm on BBC One "A big thank you to everyone at Laybrook". I was very impressed with the short lead time in ordering to delivery (just 2.5 weeks) Special thanks to Yvonne who was very helpful in arranging delivery and installation with everything working out exactly to plan. The bed has made a real difference to my mother's comfort and has given her back a certain amount of independence and dignity which is very good to see. Good luck and continued success with your business. Recently while recovering from spinal surgery I was introduced to a remarkable range of supremely comfortable fully adjustable beds marketed by Martin and his business partner Yvonne. Such have been the remarkable benefits I have derived since taking delivery last November of one of their fully adjustable beds that gone are the sleepless nights and further spinal surgery has been deferred indefinitely. A great product, but more importantly a really outstanding level of customer service, genuine, flexible, nothing too much trouble, focussed on the client getting what they needed. Might sound like a cliche but we could not recommend them more highly than we do. Care to Comfort is a young company going in the right direction. Its staff are most courtious, pleasant and professional. Myself and my family purchased an invalidity bed for my wife due to leave hospital, the bed we chose had to be made and could not be delivered in time, so Care to Comfort offered to give us a loan of a similar bed until the bed we chose was delivered, which we duly accepted. How is that for GOOD BUSINESS.! all times most helpful and caring. I can thouroughly recommend without hesitation Yvonne and Martin. I purchased a bed from Care to Comfort four months ago. The bed is the essence of COMFORT. I enjoy a wonderful nights sleep. The sales and service staff were friendly and helpful and really live up to their name of "Care to Comfort"